US demand for specialty films is forecast to rise 4.8 percent per year to $8.4 billion in 2019. Barrier films will remain the dominant function, while biodegradable and water soluble films will grow the fastest. The best opportunities for growth in the dominant packaging market will be in meat packaging, while construction will be the fastest growing market overall. 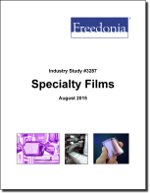 This study analyzes the $6.7 billion US specialty film industry. It presents historical demand data (2004, 2009 and 2014) and forecasts (2019 and 2024) by function (e.g., barrier films, microporous films, safety and security films), resin (e.g., polyolefin, polyester, nylon), and market (e.g., packaging, personal care products, electronics, transportation equipment, construction). The study also considers market environment factors, details industry structure, evaluates company market share, and profiles 44 industry competitors, including Bemis, Sealed Air, and DuPont.